From the kitchen of One Perfect Bite...Contrary to rumor, I don't travel with my KitchenAid mixer. When we're camping or visiting places where there are no restaurants, I arm myself with simple recipes that can be prepared in minutes with nothing more sophisticated than a wooden spoon. I've made these cupcakes for years. They're simple enough for a child to prepare and they're perfect for fall. The aroma of these cakes baking perfumes the kitchen with the scents of Island spices and the promise of a Thanksgiving yet to come. I think you like these. They're a cake type muffin that's made less pedestrian with a wonderful cream cheese frosting. Here's the recipe. 1) Preheat oven to 350 degrees. Line 18 muffin cups with paper liners. Set aside. 2) Combine flour, baking soda, salt, cinnamon, ginger, nutmeg and allspice in a medium bowl. 3) Combine eggs, and sugar in another medium bowl. Whisk to combine. Add milk, butter and pumpkin puree; mix with whisk or wooden spoon until smooth. Add flour mixture and beat until combined. Fill prepared muffin cups with batter. 4) Bake for 20 minutes, or until a toothpick inserted in center of cake comes out clean. Cool in pan for 1 minute. Remove from pan and allow to cool completely. 5) While cakes are baking, place cream cheese, milk or maple syrup and maple extract in a bowl. Beat till combined. Gradually add confectioners' sugar until smooth and creamy. Add more milk or syrup if frosting is too stiff to spread. 6) Frost cakes and garnish as desired. Ooooooo yummmmm. This recipe sounds wonderful, and since my husband loves anything maple, I just have to try these. Thanks so much for the recipe and all the inspiration you give us. Cupcakes are always pretty easy to make. I usually do things without the electric whisk. It seems like more fun when you have to put more work to stirring up the batter than just holding the mixing machine over it. I <3 pumpkin! I can see you are already rolling in to the Fall season! Mmm. One perfect bite! Each. I'm drooling**I love the topping and I love the look. It's perfect! We're having a halloween party for work and this is what I'm making!!! I am laughing that you say you do not travel with your Kitchenaid:) I copied your recipe for my cooking group to try next month. I went to buy Pumpkin this week and my market said they will not stock it until October which I found so strange? I was hoping to make a bread pudding for his Sunday for my company but no such luck. It's early. Hubby still home before setting off to work. We both said, "Yum!" These are a weekend to do. THIS weekend! Well, I gotta say this....it'll definitely be a PERFECT BITE making these for my dear man. AND me!!! Hope your weekend will treat you well Mary. Mary these look wonderful! Thanks for another great recipe. Mmm, I can smell fall right through the screen. Delish! These look so wonderful!! Your photo looks like an advertisement and let me tell you I'm sold!! Oh my goodness, I'll bet these DO smell so good when they're cooking and that frosting! Love it!! yum yum yum... i am making maple salmon for dinner tonight, i think i need to divert that over to frosting! Oh, I am so glad that pumpkin season has arrived! Recipes like this make it even better. I know my family would love these beautiful and delicious looking cupcakes. We're on the same wave length, Mary. I just made a pumpkin pie. Fall is definitely in the year. The Maple Cream Frosting sounds just delicious! I'm going to make these this weekend with my kids. These sound wonderful, Mary! I love the idea of the maple cream frosting - Mmmmmm, fall! These look wonderful and I MUST make these soon. Thanks for posting it. BTW, I am making the hummus you posted recently over the weekend. I love a good hummus and that recipe sounded great. Carolyn, I think you'll like the hummus. The folks at Serious Eats featured it earlier in the week. I was thrilled. Try to make it the day before you serve it. Mary, thanks so much for your advise about my scones. I will try that. The Amish always make pumpkin and cream cheese goodies available at local farmer's markets. Now I can make my own. I will make these soon for sure. Thanks, again. Oh my goodness, now THAT'S what I'm talking about! There's nothing I love quite like fall flavors, and that photo makes those cupcakes look to-die-for! Would you believe that I have been to the grocery store three times now and I have yet to find either pumpkin puree or pumpkin pie filling? Every time I go there is a sign that says "coming soon". Not soon enough! These are adorable! I love pumpkin cupcakes! Thanks for stopping by. I so love this recipe. It sounds so yummy for the tummy. This is one I am saving. Right up my alley. Thank you sweetie. You asked about Amy's Dr.s and suggestions. They checked them out of the hospital, and have never heard from them again. They sent her home to die, with nothing. My Moma and Daddy did purchase one of those air mattresses that the air goes up and down throughout the body, changing locations to keep the body off the hard mattress. Even with that your body breaks down over time. Hospice has helped with what they can. They are making sure she has meds and is comfortable. The Dr.s didn't even tell them what to do if the tumor breaks open or what to do when she passes. Hopsice told them. They have been a big help to Debbie and family. I wish I could say the same for the Dr.s, but not so. They didn't even tell them that eventually the tumor would get so large that it would start pushing her trach. out making it near impossible for her to breathe. Don't you think these things would be of importance? I sure do. I am leaving Wednesday for Oklahoma. It is time to go. I will be there for 17 days. I am hoping to be of some help along the way. Pumpkin is very popular at our house! I am going to make these to pack in my daughter's lunch! oh yum, i love how the frosting has maple syrup!! This sounds so good. 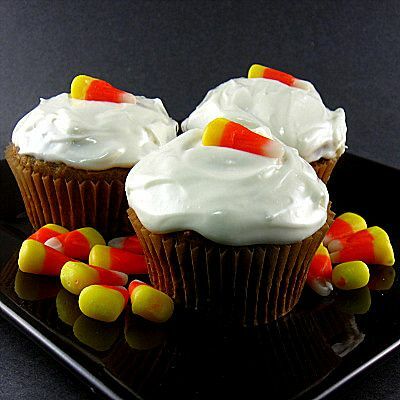 Pumpkin cupcakes sound perfect for this time of year. The frosting sounds wonderful with the maple extract! Simple enough for a child eh? I might try them. Maple is one of my favorite flavorings. My Goodness these look and sound amazing! As soon as I run out of desserts in my house I'm onto these ones! (We have lots of leftovers sweets from daughter's birthday party). The perfect fall treat. I like your family pictures you have up! Oh my! These cupcakes look divine! What a great recipe. Thanks for sharing. Oh these are a wonderful idea, I can't wait to try it out. It would be lovely for my little girls sleepover. Those cupcakes look soooo good and sound even better when you describe them. A real autumn treat I would say. As always your food and your pictures are perfect. Thanks for this scrumptious recipe! thanx for stopping inn :) I just love, love love candy corns..
lk - your secret's safe with us :-). This sounds wonderful! I love pumpking and maple together. My kids would really enjoy these too. Yum! I love baking with pumpkin, and the cream cheese maple frosting sounds fantastic! I am so going to make these. Visiting with friends next month and will make these as a take-along!! These look absolutely delicious. I can't wait to try them. Wow, these look and sound fabulous! Thanks for sharing the recipe. You are amazing! Ah, Mary-- pumpkin says fall as much as ginger . . . these look yummy and I love your decorations. Oh, those sound delicious. I do love pumpkin flavored bake goods. Thanks for the recipe. What a great recipe, they are look so yummy. I love anything with pumpkin. So fun and festive! Love the frosting! Mary, this one I can taste right now!!! I'm making this so soon! Have a happy day and thank you for your sweet comment and support. These may be the most incredibly gorgeous cupcakes I have ever seen, I am sure they are equally delicious. I LOVE pumpkin muffins! Cute presentation! Deeee licious! I love anything pumpkin really. Mary- have you ever thought of selling your photos on your site. They are amazingly beautiful. These will be perfect for thanksgiving - I always like to make something new and different for the dessert tray and these will be front and center - Thanks so much!! We'd love to serve these fall-flavored treats at a pumpkin carving party. Something tells us they'd be gone faster than you can say, "trick-or-treat!" I removed cloves from the ingredient list because I thought they made the cakes too bitter. I neglected to remove it from the instructions. I'll remedy that immediately. Thank you for pointing that out to me. What a wonderful recipe, and what a beautiful blog Mary!! I'll be back again and again! I was in the restaurant business and I was a professional cook/caterer for many years. Now painting takes up most of my time, but I still love to cook and feeding family and friends is one of my greatest passions. I'm sure your blog will come in very, very handy! !